If your browser does not plays the video, MP4 file can be downloaded here. This animation was created as part of Xiaoji Chen's SMArchS thesis at MIT. The distances in the map are scaled with reference to the time it takes to travel to locations from Paris, Lyon, Poitiers and Banos. The map is animated to reflect the traffic condition at each hour of a day. 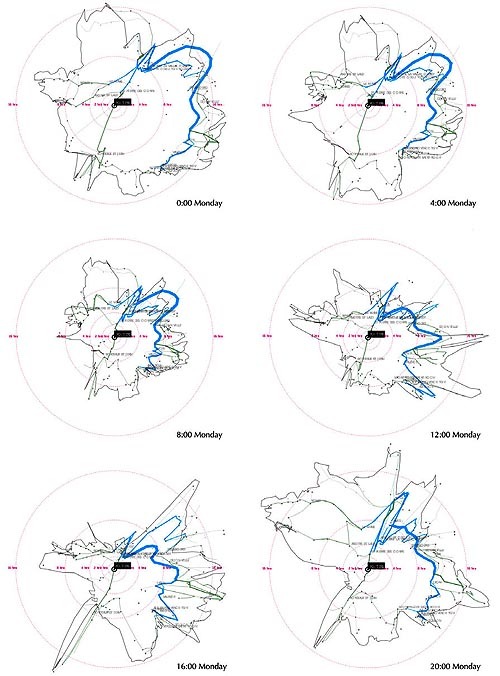 Seeing Differently: Cartography for Subjective Maps Based on Dynamic Urban Data (June 2011). What should maps look like in the information age? 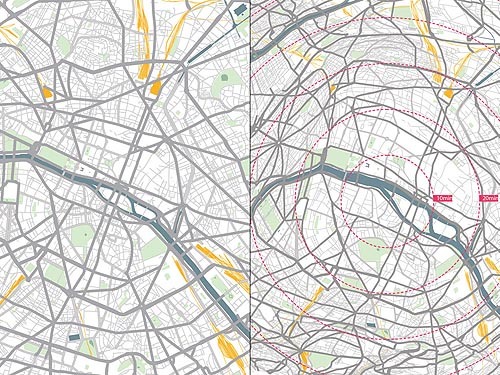 This thesis proposes dynamic subjective map - maps that are tailored to the context of the observer - to digitally bridge the gap between man in cities and massive urban data. Throughout history, maps have been evolving from subjectivity and ideals towards objectivity and accuracy. Cartography has become a precise science that excludes much inspiring narrative, which was commonly seen in ancient maps. The dynamic subjective map in this thesis explores ways to embed narrative and meaning into urban data visualization, and uses animation and interaction to create a more personalized cartography. 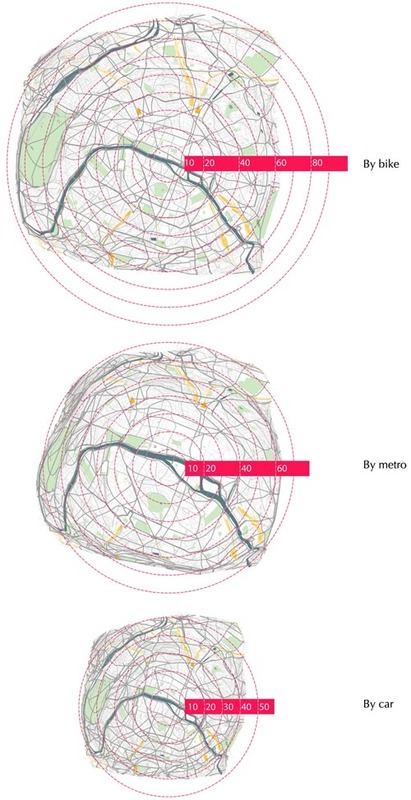 In this map, space is no longer defined by geographical features alone, but with human-related factors such as transportation time, population density or social connections as well. Major portions of this thesis were sponsored by and produced as a part of a research project for Prof. Carlo Ratti's Sensable City Lab at MIT. An arbitrary set of control points are selected on the map, usually major stations or traffic hubs, for calculating travel times, and a connection graph is constructed with the control points as nodes and travel times between them as edge lengths. Images show conditions at every four hours from midnight to 20 pm. This map is produced from a massive tracking records of cabs in Singapore during August 2010. The GPS device on each cab reported its coordinates and service status to the headquarter on a minute-to-minute basis. 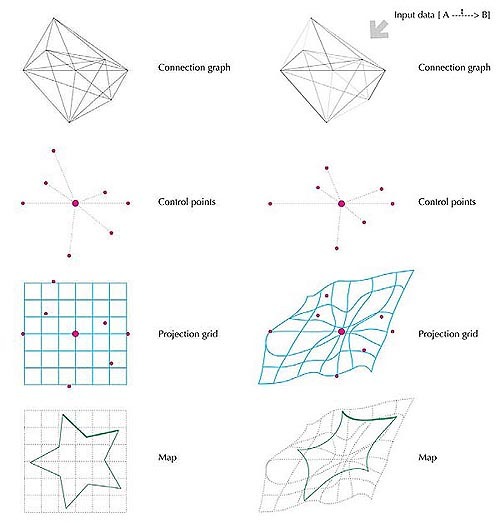 The locations of cabs were assigned to control points by a voronoi graph and the time difference between sequential appearances of the same cab at different control points were used as edge lengths in the connection graph.